So I am carrying glass pieces to work with me today to finalize exactly what I want to accomplish while I am at Malcom's studio tomorrow. If you recall, I managed to find out that he had a glass saw for rent, so I'll be at the studio tomorrow morning and ready to cut the larger centerpiece of glass as well as additional side pieces. I hope Malcom might have a few minutes to talk also - he is WAY more experienced with glass than I am and I had a few questions that he might be able to answer. I got my next weekly prompt for my drabble. Fell Beasts have ended and we are starting a much more benign series based on hairdressing terminology. So from Balrog to Comb - whew! Did you hear the air moving, that was the whiplash of my head moving from one polarity to another - LOL. And I got my story assignment for the LOTR Big Bang. I had mentioned this a while ago - I'm not writing for it for a variety of reasons, not the least of which is the length of the story required, but I did speak to the moderators, show them my art, and ask if I could be assigned as an artist. They agreed, and I have now had an author assigned to me for me to create artwork for their story. I'll be turning this around in my head, and I'll need to double-check their deadlines also so that I'm sure I'll be timely with my format and then I can think hard about what type of artwork I want to produce. This will be fun! 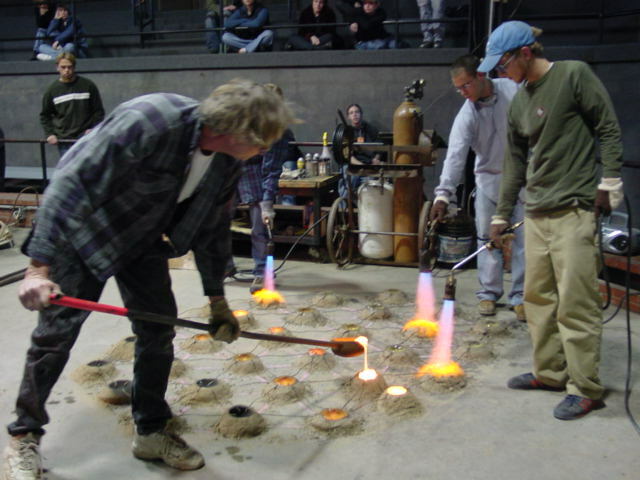 I find the plasticity of molten glass, while it is cooling, intriguing - I have never had experience of working glass but have watched it being blown and worked. I know that is not the same as cutting it with a glass saw but your picture made me think of it. Glass is amazing stuff and I love playing with it in many different ways. I don't blow glass, although I know the mechanics of it, nor do I lampwork, but I do fusing and I do enameling, so I play with the media whenever I can.